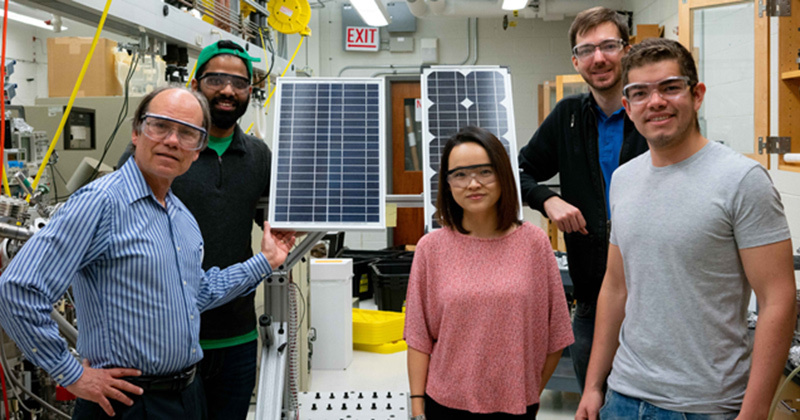 A startup that’s figured out how to make solar cells at a very low temperature is following the entrepreneurial process at the University of Delaware because of its international renown for research and innovation in the space. Iyer and his startup have also been helped by Horn Entrepreneurship, which provides the UD community with opportunities to explore the potential and power of their ideas through programs, grants, mentoring, teamwork and support. Iyer is co-founder of SHIO, a solar tech company that develops low-cost, high-efficiency solar cells. The name SHIO is an acronym created from the first letters of the co-founders’ last names. The SHIO team also includes James Hack, an engineering doctoral student in UD’s Department of Materials Science and Engineering; David Angel, a doctoral student in materials science and engineering; and Meixi Chen, who recently graduated with a doctorate in chemistry. The company’s latest milestone occurred April 27, when it won first place and $50,000 at LaunchR, a Rutgers University student-run clean technology innovation contest that is funded by the U.S. Department of Energy. SHIO was able to take part in innovation workshops and consult with mentors in the green technology space before pitching to an expert panel of judges, but the story of SHIO starts long before its participation in LaunchR. 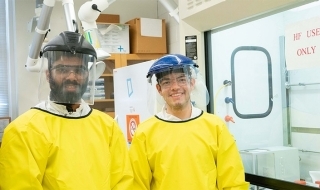 Abhishek Iyer (left) has been building SHIO through research opportunities at the University of Delaware. James Hack is also part of the SHIO team. While pursuing his graduate degrees at UD, Iyer worked with Robert Opila, a professor in the Department of Materials Science and Engineering. Opila became a mentor for Iyer’s work with SHIO. The pair quickly developed a high-potential solar technology that eliminated some of the efficiency problems that often plague the green technology. “We learned about Hen Hatch, a competition and saw it as an opportunity to further explore the impact of our research, so I developed the presentation for the pitch and made it to the semifinals in 2016,” Iyer said. Hen Hatch is Horn’s premier startup competition, and it provides participants with the opportunity to make connections and collect feedback on their ideas. By competing in Hen Hatch, Iyer was able to connect to and learn from many investors and experts in the field. SHIO did not reach the finals, but the promise of the venture became evident. Dan Freeman is the founding director of Horn. John Currie has offered guidance to students in a startup advising role at Horn. Following Hen Hatch, Iyer applied for a grant from the National Science Foundation (NSF) I-Corps Sites program, which provides students resources, advice and modest funding to pursue the commercialization of scientific research. Horn manages the NSF I-Corps programs at UD. After finishing the NSF I-Corps Sites program, Iyer then took SHIO through the extensive seven-week customer discovery program at the NSF I-Corps Teams level. Customer discovery is the process of speaking to and learning from potential customers to adapt the idea to best fit the needs and wants of the market. Iyer worked with now-team members Hack, Opila and Keith Modzelewski, then a Horn adjunct professor. The venture was able to test and get feedback on the proposed hypothesis to better improve the concept. Iyer, who was awarded best Entrepreneurial Lead for his NSF I-Corps group, credited his team and other supportive individuals for the early success of SHIO. The SHIO team won additional funding through the NSF I-Corps program and gained access to more experts in the industry. Through Horn, Iyer and the SHIO team were introduced to Lou DiNetta, who assists students with federal grant writing. DiNetta has a background of more than 40 years of experience in the photovoltaics. After completing the grant with the co-founders, he joined the team and continues to provide business support. Eventually, SHIO leaders chose to apply to LaunchR, the Rutgers student-run clean technology competition. The solar tech venture was one of the top six teams to pitch its idea in front of a panel of judges from the Department of Energy and experts in the clean tech space. Winning the competition means SHIO moves up to the Department of Energy’s national competition. SHIO was also invited to the national finals of the Department of Defense’s clean technology pitching competition. Both finals will be held on June 27-28 at Rice University in Houston. The venture hopes to resume researching in earnest this summer.